This report generated at 21-Apr-2019 08:27 UTC. 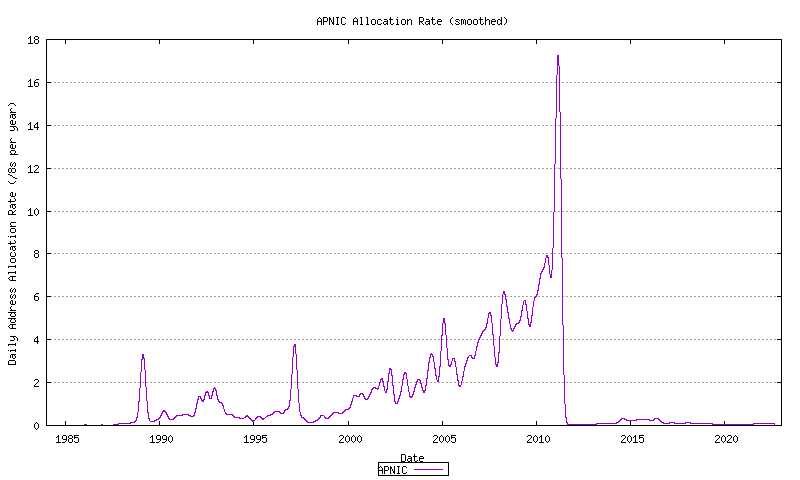 "Exhaustion" is defined here as the time when the pool of available addresses in each RIR reaches the threshold of no more general use allocations of IPv4 addresses. 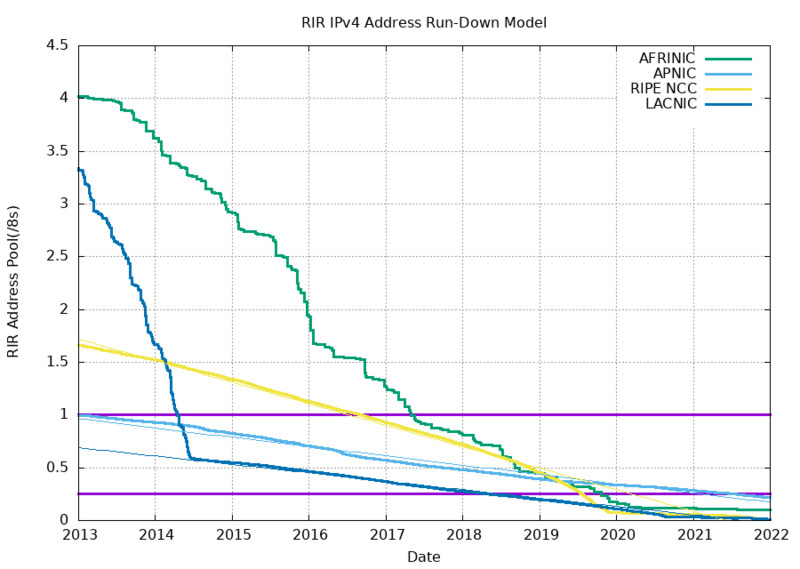 As ARIN have already reserved a /10 for the transition to Ipv6 policy, the low point for ARIN is a completely depleted general use pool. 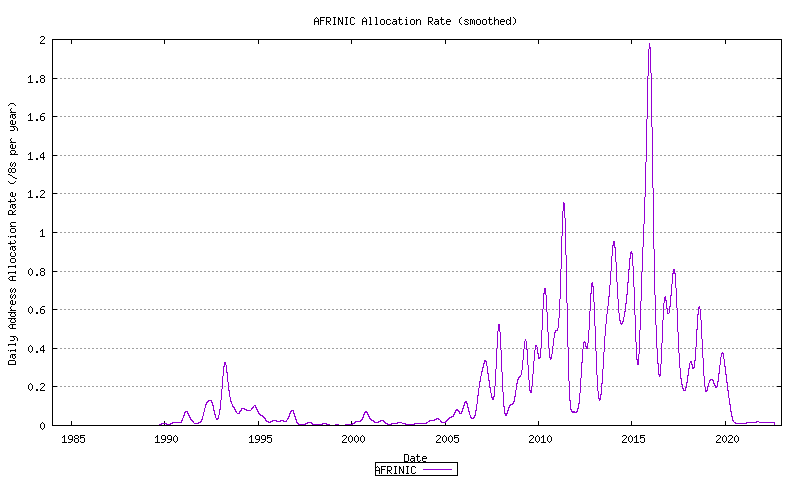 For AFRINIC and LACNIC it the threshold is a total of a /11 remaining in their available address pool. 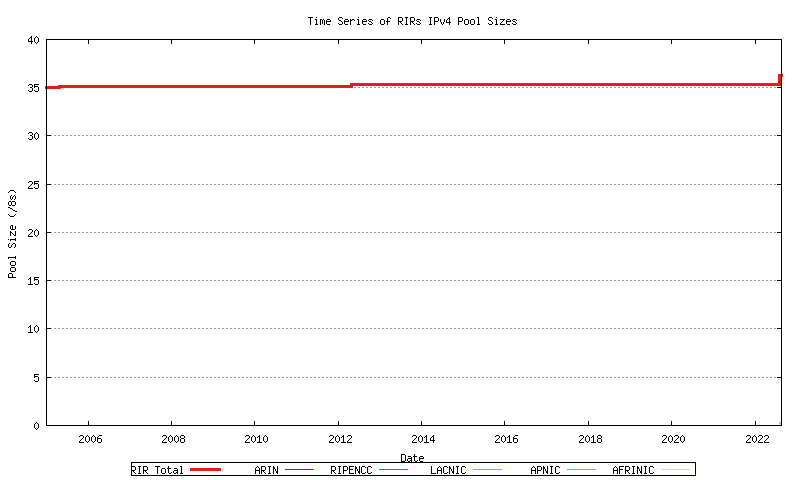 This calculation also takes into account the redistribution of the IANA Global Address pool, and in the simulation of exhaustion these addresses are redistributed to the RIRs according to the policy. The IPv4 address space is a 32 bit field. There are 4,294,967,296 unique values, considered in this context as a sequence of 256 "/8s", where each "/8" corresponds to 16,777,216 unique address values. 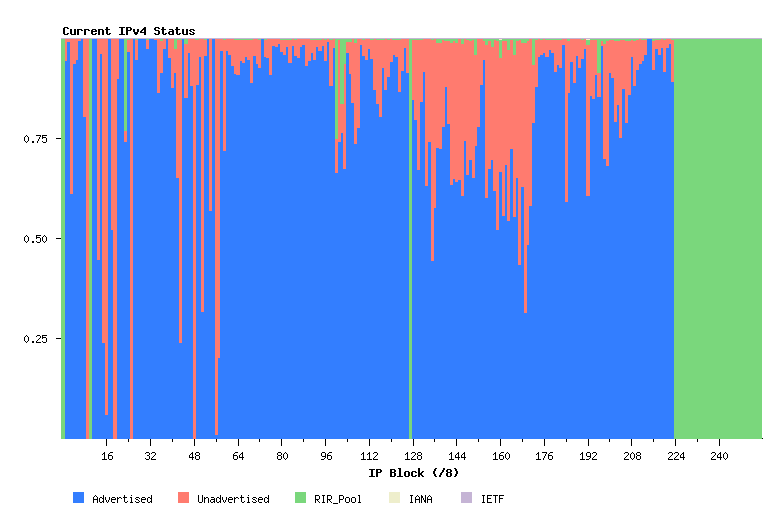 The remaining 220.922 /8 address blocks are available for use in the public IPv4 Internet. 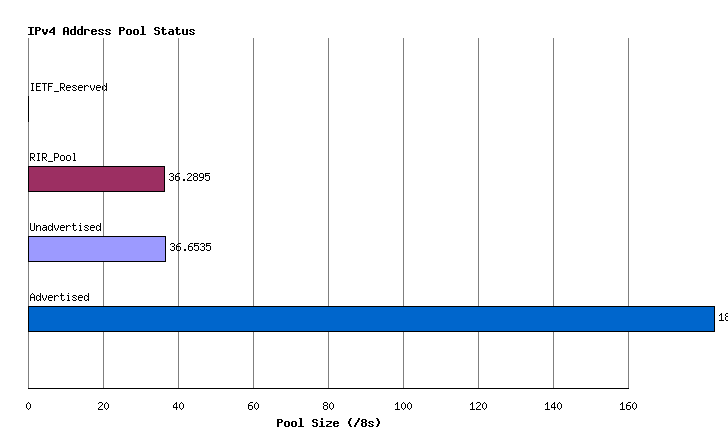 The current status of the total IPv4 address space is indicated in Figure 1. This allocated number pool is managed by the Regional Internet Registries, (RIRs) and the breakdown of IANA allocated address blocks to each of the RIRs is shown in Figure 2. 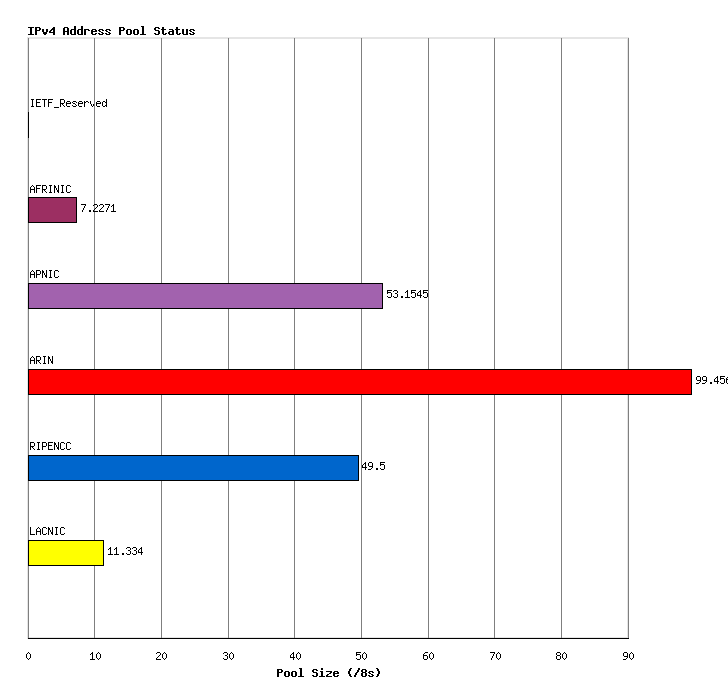 The current totals of IP addresses according to this set of states is shown in Figure 3. This status can be further categorized per RIR, as shown in Figure 4. Another view of the address state pools is by grouping the address space into a sequence of /8s, and looking at state sub totals within each /8 address block. 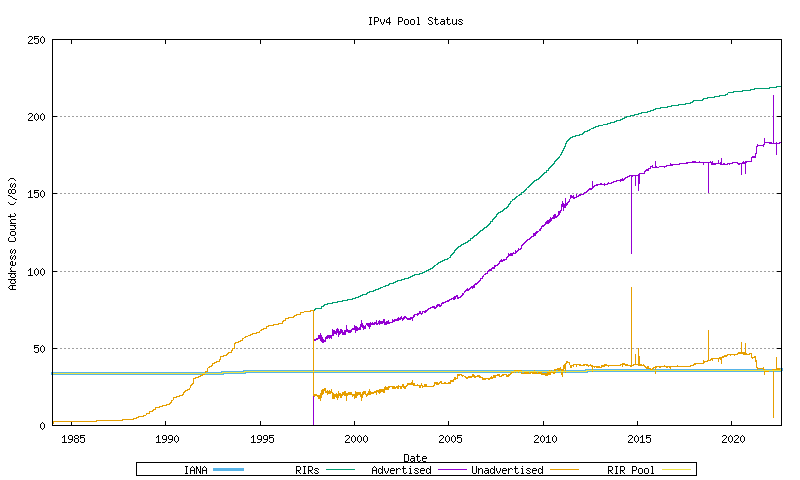 The following view shows the current status of the IPv4 address space as 256 /8 columns each describing a pool of 16,777,216 addresses. 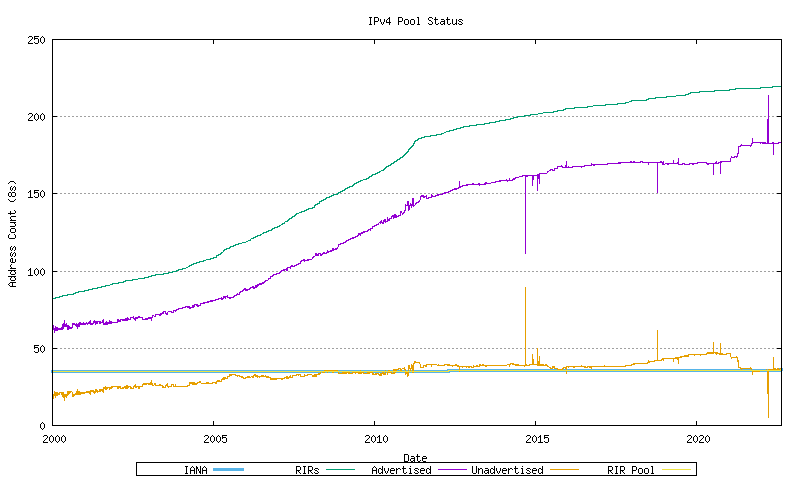 IPv4 Address are drawn from the Unallocated Address Number Pool, administered by the IANA. These allocations are made to the Regional Internet Registries (RIRs), and the allocation unit is in units of /8s. This series can be further broken down by RIR. 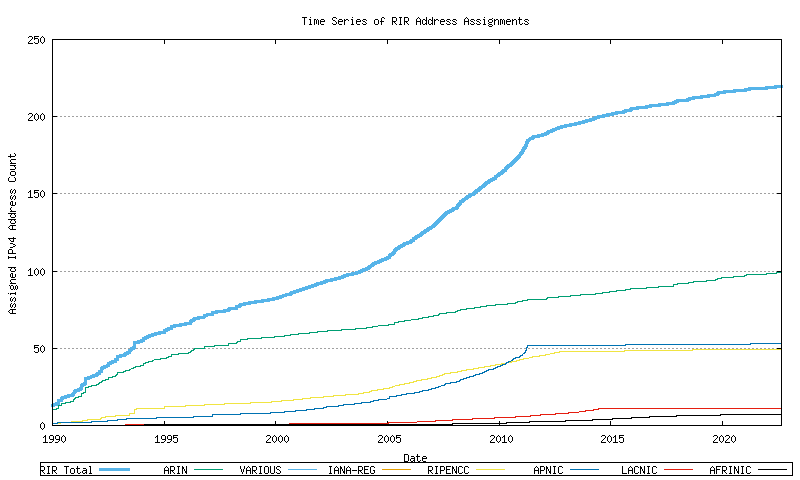 RIRs perform assignments of address blocks to ISPs and local Internet registries. 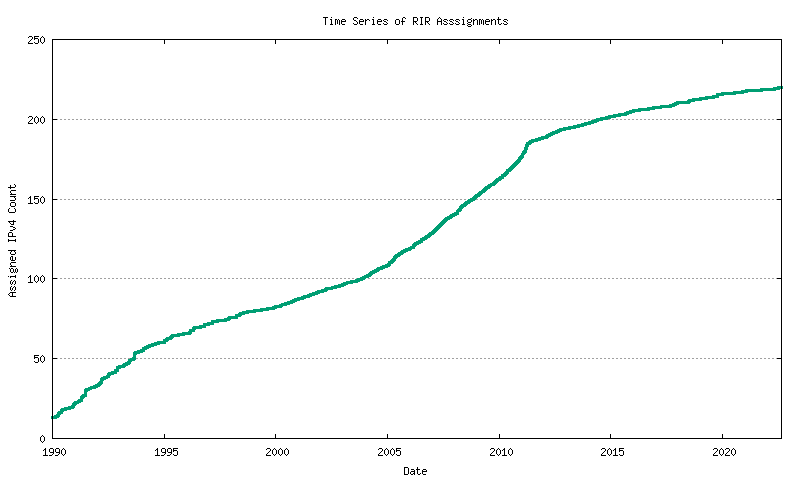 The cumulative number of assigned addresses over time is shown in Figure 8. This data can be further categorized by RIR. Each RIR allocates from its locally administered number pool. 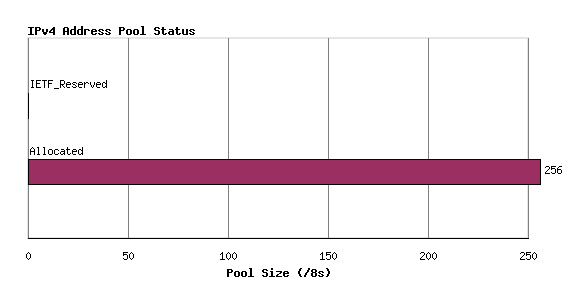 When the pool reaches a low threshold size a further address block is allocated by IANA to the RIR. 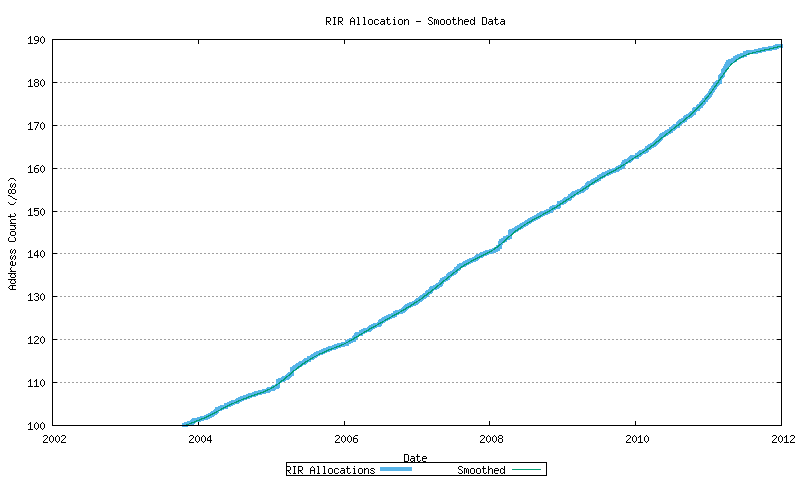 The allocation quantity is based on the allocation activity recorded by the RIR for the 18 months prior to the allocation request, rounded to the next largest /8 address block. 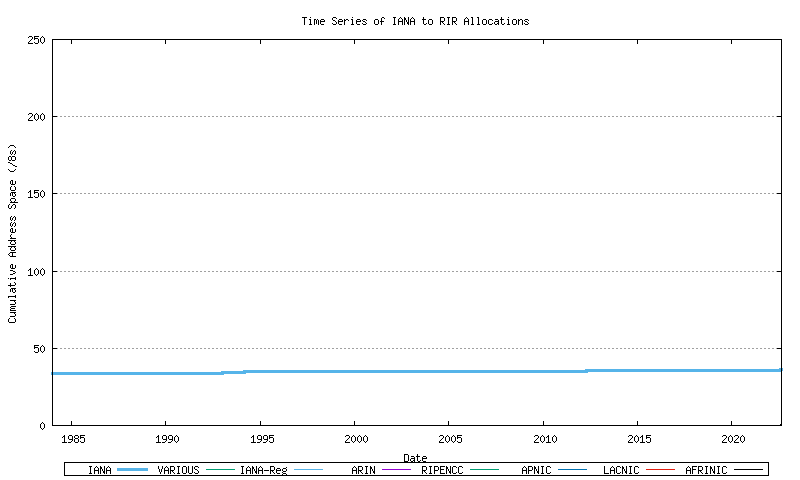 The pool size within each RIR over time can be derived from the allocation and assignment series data, producing the following graph. This is indicated in Figure 10. 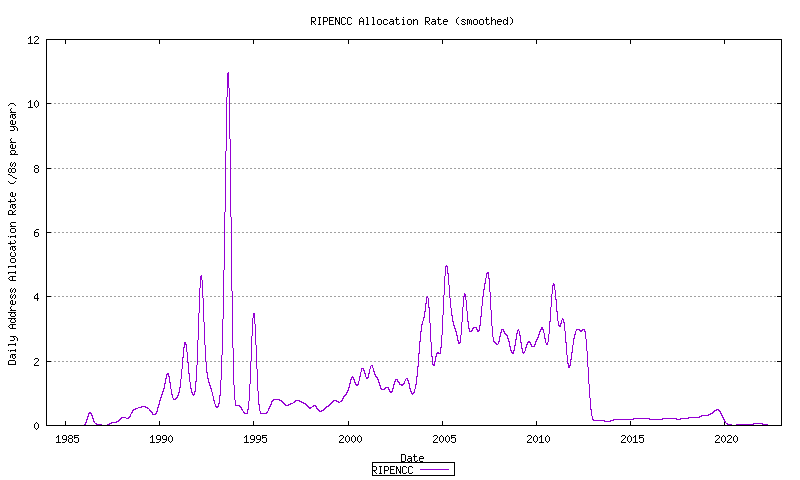 The more recent data from this series is shown in Figure 10a. 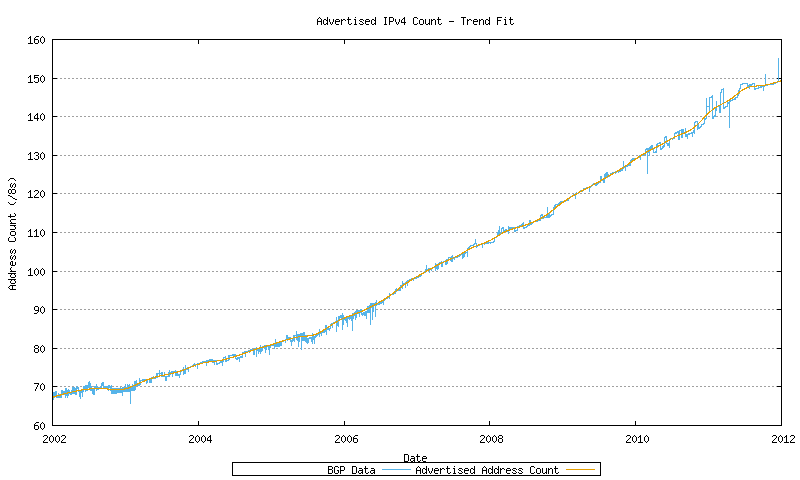 The next data set is total span of address space advertised in the BGP routing table over time. The data has been collected since late 1999. This is shown in Figure 11. The more recent section of these series is indicated in Figure 17. The approach used here is to take a recent sequence of data as the baseline for a predictive model. Before looking in detail at the advertised address space, the IANA allocation data and RIR allocation data will be examined, and a relatively straightforward form of data analysis will be performed over the data series. 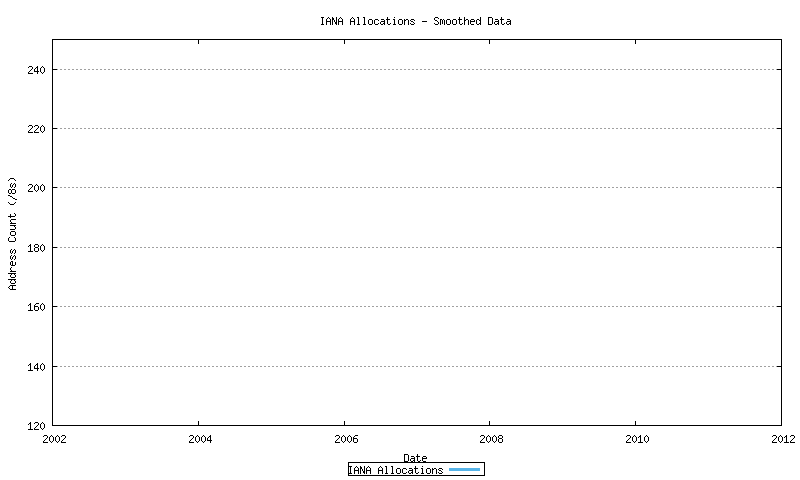 The IANA allocation data is indicated in Figure 18. 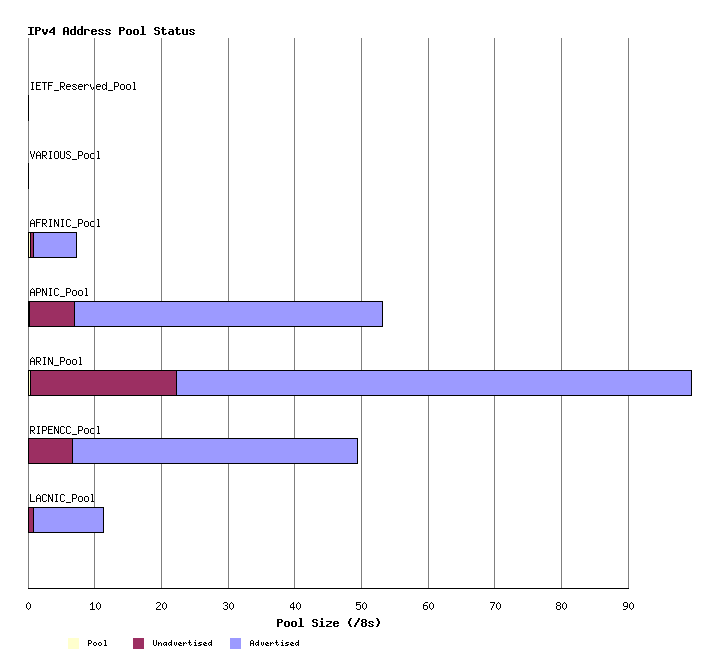 The RIR allocation data is indicated in Figure 19. This data is shown in both its original format, and in a smoothed format, using a sliding window smoothing algorithm, in a double pass of the smoothing algorithm across the data. 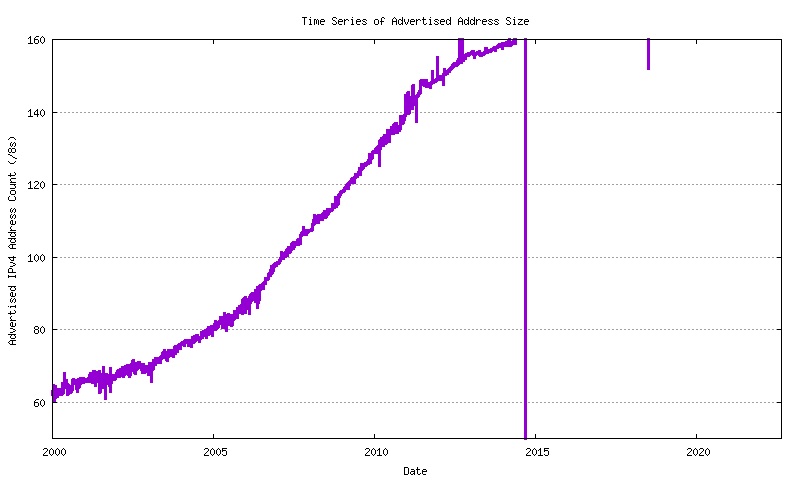 The BGP advertised address span data is indicated in Figure 20. 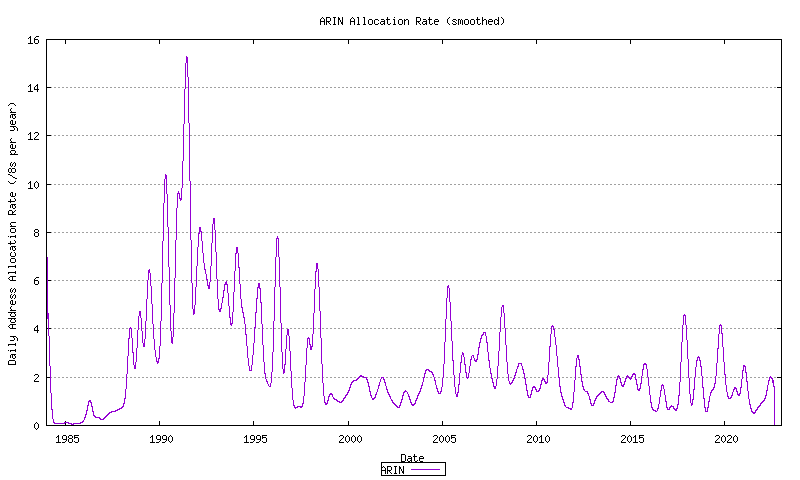 The approach used here to modelling overall address consumption levels is to use the RIR allocation information as the baseline of the address consumption model. This approach treats an address as "consumed" once it has been allocated or assigned by an RIR. 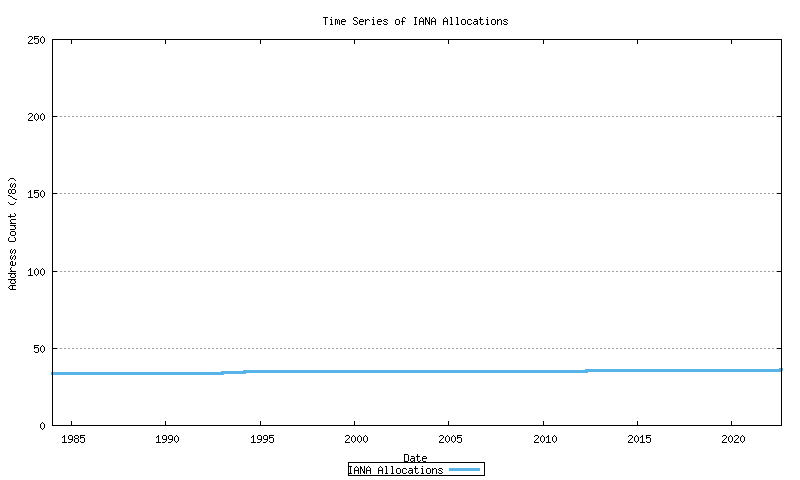 The data used to construct the time series of allocations is the allocation "stats file" published on a daily basis by each RIR, placed into a time series, as indicated in Figure 9. 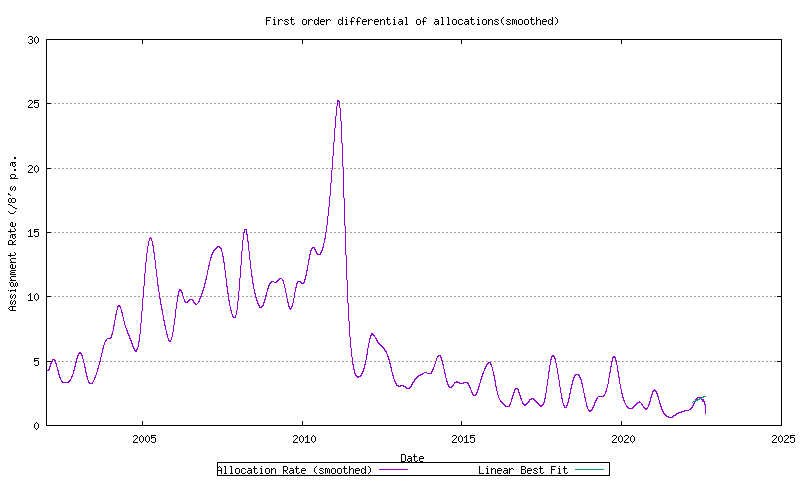 The first order differential of the smoothed total allocation rate can be generated, as shown in Figure 27. 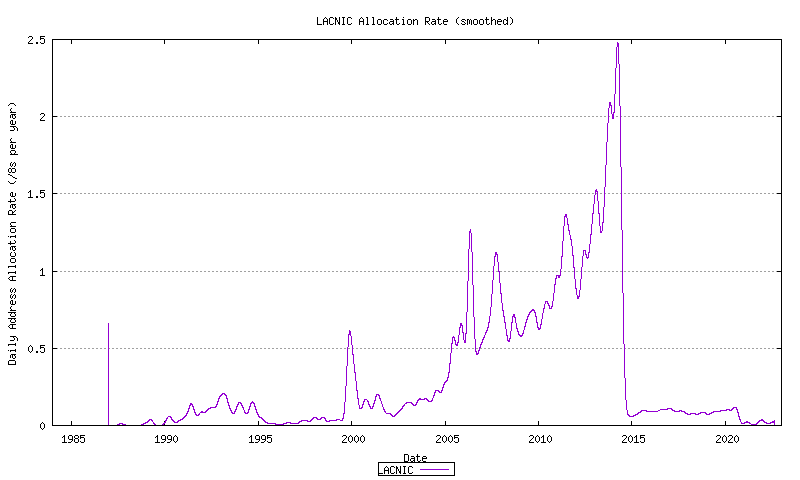 A least squares linear best fit can be generated for the recent part of this data. 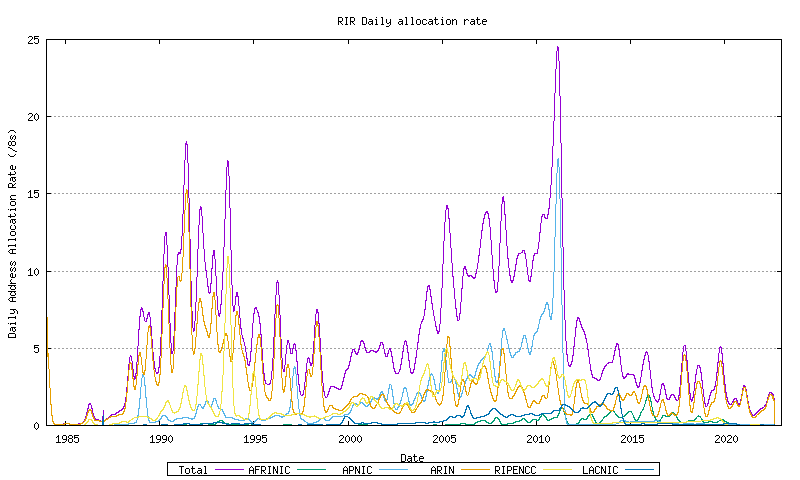 The allocation rates for each RIR are shown in the following figures.